The clock is ticking — not just on a great deal for your customers this Black Friday, but for your business to raise awareness of that great deal. Are you the type of business (and person) who leaves things to the last minute? If you are, don’t worry — there’s still time to take advantage of Black Friday. Black Friday is a crazy time of the year for marketers and businesses, with stats showing that the period between Black Friday and Christmas now accounts for 30% of annual retail sales. It takes place on Friday 23rd November, and it’s when customers whip themselves into a frenzy as they gobble up offers. While this hunger for a deal brings obvious advantages to a business, it also poses an obvious problem: Namely, that of standing out. Of course, what’s also important to point out is that Black Friday isn’t just good for the eCommerce sector — it’s good for a wide range of businesses, from SEO agencies to even SaaS companies. Remember, we all love a good deal. In this article, Nightwatch is going to take a look at exactly what you need to do boost your sales with last-minute Black Friday marketing campaigns, regardless of your sector. Here’s what’s important to know: Your customers are on the lookout for a deal during Black Friday. They know that deals are imminent — and they’re checking their emails to find them. This means that email marketing is essential during the Black Friday run. If you’re not popping up in your customers’ inboxes during this period, you’re losing. We all have an email address and we all expect brands to be in touch with a gift-wrapped discount. Of course, there’s a snag and we know you’re a bit skeptical at the moment. Because, just like you, hundreds — nah, thousands — of other brands are looking to meet consumer expectations via email this Black Friday. So how do you stand out? The first thing you should do is push email marketing to build momentum and create a sense of awareness urgency as we approach Black Friday. This means creating a sequence of emails that begin early. For example, an email sequence can start with your Black Friday announcement, before moving onto an email about your pre-sale like Great Simple Studio did. Then, you can to hit your subscribers with an email on Black Friday itself, followed by a “LAST CHANCE TO BUY!” email the next day. Such a sequence is a great way to raise awareness, build anticipation, and it can increase sales and you can use a tool like Google Calendar to create a schedule. What’s important to remember about emails during Black Friday season is that you need to make sure yours stand out from your competitors. Remember, everyone will be selling this Black Friday. As such, put yourself into the mindset of your customers: They’ll probably be tired of the same-old sales and discounts-type emails. This creates a sense of urgency. Make people aware as soon as you can about your deal, and keep them excited while building anticipation as the days pass by. Consider adding a “limited time only” deal to your email marketing campaign too, as the fear of missing out is real. In terms of copy, check out the image below from Stripo. “It’s our biggest sale … ever” is a bit dramatic — but it works. It drums up interest and grabs the reader’s attention. As well as going for the big headline, though, the company makes sure that their customers know exactly what they’re going to be getting great deals on by running through their inventory. Milk Street is another company that runs through their inventory too, so that customers know precisely what’s on offer. Ask yourself: What are we offering deals on this Black Friday? And then include each item in your email. Customers might not react unless they know what’s on offer. Don’t forget to reward your loyal customers with an early bird discount. All you need to do is use your autoresponder to segment your list and, as Black Friday approaches, raise awareness of your deal and how loyal customers can get an even bigger discount if they buy earlier. This can really work because, interestingly, research has shown that the best deals are not actually on Black Friday itself, but in the days leading up to Black Friday. Another tactic is to send out cart abandonment recovery emails to previous customers who have abandoned their carts halfway through the buying process. You could remind them of the products they so nearly had, and how you’re now offering a discount on them. This is an easy to way to boost conversions, and stats have shown that it can even increase sales by a whopping 100%. Are you ready to be a big tease? Social media can complement your email marketing efforts, and you can use them both to tease deals, letting your followers know what they could have in a few days time by creating posts about your upcoming deals and offers. Make sure to tie your social media efforts in with your email marketing efforts. Let your customers know that special offers will be sent via email. Hashtags make you more discoverable on Instagram and Twitter, and you’ll want to take advantage of them on these two platforms in the build-up to Black Friday. Of course, you’ll be looking at using the typical #blackfridaydeals hashtag, but you should also do a bit more research into what other less competitive hashtags are trending. Make sure any hashtags you choose are relevant to your deals, too, and be creative. The last thing you want to do is compete with everyone else for the same hashtag. It would be awesome if you can create a hashtag that’s entirely yours, and which only your brand is using. This is what Patagonia did for Black Friday 2016 when they created the hashtag #loveourplanet. The idea behind the hashtag (and the Black Friday marketing campaign) was that customers were getting a great deal and doing their bit for the environment. To this end, Patagonia used social media to raise awareness of their values — values that they share with their audience. They tapped into their customers’ core beliefs and combined it with a sale. Everyone won. How much did Patagonia win by? Well, they experienced $10 million worth of sales. As you can see from the image Patagonia used on social media, they weren’t afraid to tap into the right emotions, too. Remember that people shop based on their emotions, not logic. Use images to pique their interest while making them feel exactly how you want them to feel. Make them feel positive, happy, delighted, inspired. The great thing about social media is that it allows you to partner up with another brand and generate more exposure, more traffic and more sales for those crucial few days leading up to Black Friday. This is exactly what Pieminister did when they partnered up with a homeless charity to whom they donated stock in return for donations during Black Friday. Their homeless charity of choice — Shelter — had a much bigger following on social media, and this allowed Pieminister to tap into an entirely new audience. And perhaps most importantly of all, you’ll want to plan and schedule your posts ahead of time. This might be last minute but have no fear — you can use a tool like Hootsuite to do this for you, and it’s key that you do. Social media is a fast-paced world at the best of the times, but it’s a lot more hectic during Black Friday. A perfectly-timed post can be the difference between a successful marketing campaign and one that misses the target. Start ASAP. Plan and use tools to schedule your posts. When you create all your Black Friday posts at the same time, they’ll be consistent. Moreover, there’s then no risk that you’ll forget to create a key post later on. It will already be done. There are a few social media hacks you need to employ throughout Black Friday season. For example, update your cover photo so that it draws attention to your sale. Update your bio so that it mentions your sale and links out to where people need to go. Do the same with your call-to-action button — make sure it takes them to your Black Friday landing page. Take advantage of each social media platform. On Twitter, pin your Black Friday discount tweet. On Instagram, use IGTV and Instagram Stories to excitedly raise awareness of your sale. Paid ads can be key to your success during Black Friday. You don’t have much time to make your pages more visible on Google organically, so why not pay for more traffic instead? Normally, a PPC campaign is geared towards the longer term. If you’re doing Black Friday at the last minute, however, you’ve probably only got a few days — or maybe even just 24 hours! Don’t worry, though. While the wrong bid and wrong ad can totally ruin your big plans, there are ways to make Black Friday PPC work for you. Assuming you have already used PPC before, all you really need to do to make it work for Black Friday is perform a few tweaks. Remember that Black Friday shoppers have a different mentality to regular shoppers. They’re looking for a deal and your ad needs to be compelling and clear enough for them to want to click. iSpionage have done some research on seasonal PPC campaigns. When they typed “Cyber Monday” into Google, they were met with ad copy from a company called NastyDress. The ad copy used “Cyber Monday Online” in their headline, along with “80% off with free shipping for 10,000 products” in the copy. This is compelling and exciting enough to make people want to click. What’s important when you use ad copy like this is that you then back it up with your landing page. There needs to be continuity for a PPC ad to work flawlessly. If you’re claiming “80% off with free shipping for 10,000 products” it’s important that you also make this as visible as possible on the landing page to keep people on the customer journey. If you don’t adjust your landing page so that it matches up with your tweaked PPC ad, you’ll lose out. User intent isn’t something you need to lose sleep over. You already know what users are intending to do — they want to buy. Don’t forget to tap into the immediate emotions of your buyers, too. For example, use words like success, happiness, joy and so on. These are minor adjustments that encourage more clicks during the Black Friday rush. You need to increase your budget by a large margin for your Black Friday PPC ad(s). This is obvious because searches for products and services naturally go up on Black Friday. CPC increases over any holiday period because the competition increases. You could run a ‘standard delivery’ but here’s the thing — Google won’t have your back. Standard Delivery is a standard setting that’s determined by historical data and is therefore totally useless on Black Friday. In order to boost your conversion rate with Black Friday PPC, it really is all about spending a bit of time tweaking your ads and ad copy so that they are more specific to Black Friday and your promotions. Have you ever used your landing page as an effective marketing tool during Black Friday? If not, you’re in good company. 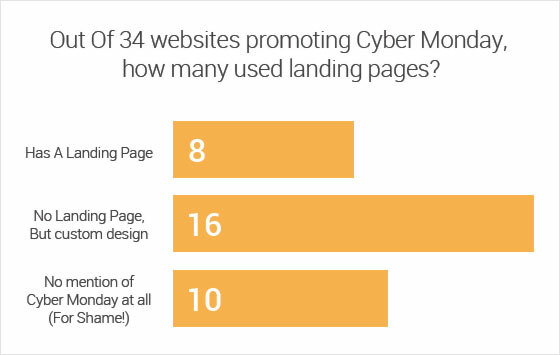 According to a random sample of campaigns looked at by Unbounce, only 8 out of 34 companies promoting Cyber Monday even had a landing page! It’s important that you prepare your website for Black Friday a few weeks before it starts. For one thing, you need to make sure that your website can even handle the huge influx of traffic that’s probably going to arrive. If you’re worried about your server load capacity, you can use a tester tool like Load Impact. Then, you need to make tweaks to your website so that your customers are super aware that you’ve got some great discounts coming up on Black Friday. How about creating a sales banner for your landing page like the one below from Amazon? However you design your sales banner, remember that it needs to be optimised for both the desktop and mobile versions of your site. This is really important because data showed us that for Black Friday 2017, 26% of orders came from a mobile device. Take a look at what Google thinks of the mobile version of your site and then assess what the experience is like. Is check-out easy and fast? Analytical buyers can be really hard to sell to. They do a lot of research and want to be fully educated and informed about a product or service before they buy. To this end, it’s a good idea to put together a few product reviews in your blog before your sale starts. This will allow buyers to do research first so that they know that they’re getting a) an awesome deal and b) an awesome product. Bolster your chances of a conversion with product tutorials, too. There are a couple of different types of landing pages you can create to boost conversions this Black Friday. One is the “flash sale.” This is where you set up a load of flash sales that you then release one-by-one during the day. You could include a countdown on your landing page that tells visitors when the next flash sale is due. This kind of landing page should — in theory at least — boost anticipation and engagement, and it’s a great way to make people excited about forthcoming sales. Another type of landing page you can create is a promotional code page. For this one, it’s important that you don’t obsess over your promotional code. While the promotional code is obviously key, it’s important that you remain just as focused on your product or service, as well as their benefits. These are ultimately what will sell your stuff. ONE Medical Group is a company who chose to use a promotional code landing page, but as you can see from the image below they missed a trick by not focusing on their product or service. What exactly are people signing up for here? Why should they sign up? Of course, we get it — you’re in a rush. This is the last minute. As such, you don’t always need to reinvent the wheel but can instead tweak an already existing landing page — especially if it’s working really well for you. The most obvious tweak you need to make so that your landing page is primed for more conversions is to create more urgency. All you need to do is remind your customers that you’ve got a limited time offer which will expire shortly. To further push people in the right direction, consider adding a countdown to your landing page. Whatever you do, make sure that any images you include on your landing page are relevant. Images are super important, as they reassure site visitors that they’re in the right place. It’s also really important that you take care of the “little things” during Black Friday. This means optimizing your site speed so that it doesn’t take too long to load, as well as simplifying the checkout process. This is how to boost your conversion rates with last-minute Black Friday marketing campaigns. As you can see, it doesn’t matter how late you are to the party — what matters is that you show up. Provided you do the right things as outlined in this article, you can beat your competitors, boost your conversions and increase your revenue. How did you get your campaigns ready for Black Friday? Let us know in the comments!